A very royal Baby on Board – but would you wear the badge? Watching the news last night, the pregnant Duchess of Cambridge was visiting Baker Street underground station to help celebrate the 150th anniversary of the tube. A TFL official gave her a Baby on Board badge, resulting in much hilarity all round, as well as confusion from Prince Philip. 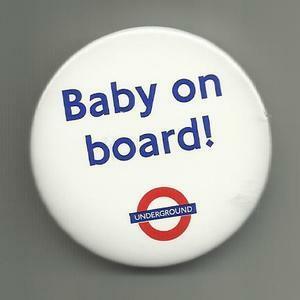 If you’re not already familiar with them, the Baby on Board badges are given out to pregnant women to wear on London’s public transport, to let people know you’d like a seat. The badges were the inspiration for the name of this blog – for the obvious connection – but despite my daily commute to and from Soho until I was eight months pregnant, I never actually got one for myself. This was for a couple of reasons really; my route to work meant I almost always got a seat, and when I finally started to look pregnant, people would mostly offer. And used to the faceless anonymity of the tube, I thought it would make me feel ever-so-slightly self-aware. However, there were many occasions where I had to stand for ages, as people either didn’t notice my bump, or pretended they hadn’t. Should I have been less stubborn and just worn one? Natasha, @foodqueenI put it on just before got on tube to help get a seat…although I wore it, on so many occasions people looked up at me, clocked the badge and looked down again at their paper! Emma, Born in 2001 – We lived in London when I was pregnant and I wanted one but never did get one! I couldn’t quite bring myself to it! Obviously Kate’s badge was all for the photocall as she never has to take the tube, but what do you think? Did you wear one when you were pregnant, and would you wear one again? P.S – I love this Daily Mash article – Kate STILL explaining the badge to The Queen and Prince Phillip. I didn’t wear a badge as I was too self conscious. I did have a big bump from early on though and found people were mostly really kind and offered me a seat straight away. I mainly get the bus around London and have to say that bus users were a lot better than people on the tube at giving up seats. Although I’m still grateful to the man on a packed rush hour tube who got someone to give me their seat and made a path for me to reach it when I was about 8 months pregnant! Funny, I’m still waiting for mine too – over two weeks now. Did yours ever arrive? I just reordered. Annoying, as we were hoping to incorporate it into our announcement.